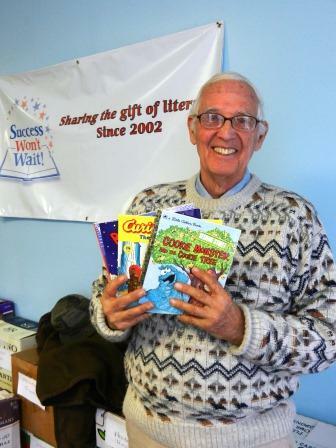 Success Won’t Wait donates 300 children’s books to pre-school literacy program in Phoenixville, Pennsylvania – Success Won't Wait! Larry Jilk, founder of the Phoenixville Project, shows off a few of the 300 children's books destined for new literacy centers. Did you know that reading aloud to a child who is at-risk gives them an important head start? And, this read-aloud time is most meaningful in the child’s first four or five years — even before he reaches school? These, and other important read-aloud statistics and facts are found in Jim Trelease’s New York Times best-selling book The Read-Aloud Handbook. This book is the basis for the new read-aloud project of Phoeniville, Pennsylvania. The brainchild of resident Larry Jilk, this is a project that reaches at risk pre-K children and provides literary-rich environments at centers throughout the area.